A circle of radiant 9ct white gold claw set with beautiful diamonds to create an irresistible wedding or eternity ring. A captivating symbol of your eternal love. 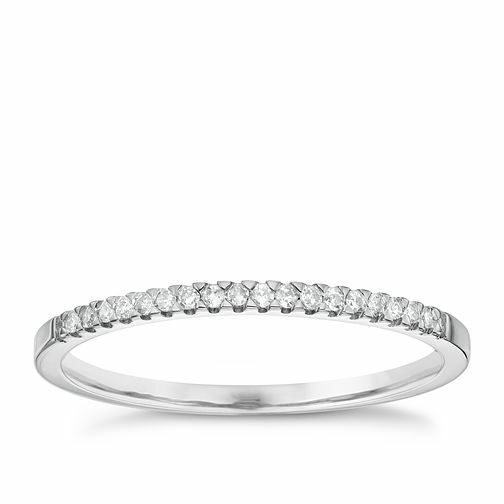 9ct White Gold Diamond Wedding Band is rated 3.4 out of 5 by 9. Rated 1 out of 5 by Anonymous from stone fell out after 3 weeks I have only been wearing this ring for 3 weeks and already a stone has fallen out! Will be returning as its clearly a fault based on the previous reviews. Rated 1 out of 5 by Anonymous from Stone Fell Out I bought this ring four years ago as a wedding ban. It is very tiny and very pretty. It however hasn’t lasted very well. It has lost a stone and Ernest Jones charge for these to be replaced. I took it to another independent jewellers and they said eventually all the diamonds would fall out as the claws were so tiny. Now going to scrap it and buy a new one. You really do get what you pay for, a ring like this isn’t built to be worn every day.